We have helped halt or substantially alter over a dozen planned developments. We have influenced the way that ski resorts manage their slopes to safeguard cold water fish creek habitat. We have controlled phragmites in sensitive areas. We have held all three levels of government to account on issues from pesticides legislation and testing to land use planning. We have entered into dialogue with area golf courses about pesticide management. We have brought wetlands conservation into the consciousness of thousands of minds, young and old. The Blue Mountain Watershed Trust Foundation (the Watershed Trust), Ontario’s first watershed trust, was formed in 1994 to protect natural areas in Collingwood and the Blue Mountains from development pressures of many kinds. Since then, we have been instrumental in preserving and protecting our remaining wild places. The Watershed Trust is an all-volunteer independent grass-roots organization supported by donations and fundraising. We have no paid employees and do not receive funding from any level of government. The Watershed Trust was incorporated in Collingwood, Ontario 1995 and is a Registered Charity. We currently have over 170 members. Our area of interest is composed of independent watersheds, collectively ‘the Blue Mountain Watershed’ that originate in the Niagara Escarpment, a United Nations Educational, Scientific and Cultural Organization (UNESCO) World Biosphere Reserve. The watersheds drain directly into Georgian Bay and include Silver Creek, Black Ash Creek, Townline Creek, Pretty River, Batteaux River, Indian Brook, various fringe creeks, and the Beaver River. Our area of interest totals approximately 50,000 hectares. It encompasses the municipalities of Collingwood and Town of Blue Mountains. It is bounded by Thorbury to the west, Nottawa to the east, Georgian Bay to the north and extends up onto the highlands of the Niagara Escarpment to the south. The Watershed Trust has won numerous awards and received some significant donations over the decades. In 2016-2017, the Province of Ontario, the Town of Collingwood and the Nottawasaga Valley Conservation Authority all recognized the Watershed Trust for our efforts. Our members pay their $30 yearly membership dues, but they also make donations. Many people donate to support specific Watershed Trust efforts, and others plan for us in their wills. We are a registered charity and can offer tax receipts for all donations over $10. As a small grassroots charity with no paid staff, we use what funds we have wisely. The Watershed Trust is composed of local people who care about what happens to our remaining wild places. We advocate on behalf of the natural world. As Dr. Seuss’ Lorax famously said, “I speak for the trees!” That’s essentially what we do. And like the Lorax, we are facing an uphill battle. We are advocates; we bear witness. The fact is, we are only as strong as our membership and our coffers. If we had 17,000 members instead of 170, we would not only have more membership dues to work with, but we would also be even more of a force to be reckoned with. We are extremely efficacious. The Watershed Trust Board of Directors and Watershed Action Group tackle all of our many issues simultaneously. We make a tremendous difference. You simply don’t read about much of it in the news. The Watershed Action Group Committee does most of the actual work involved in protecting and preserving the Blue Mountains watershed. This includes gathering water samples; meeting with town officials, developers and golf course management; undertaking conservation projects in the field (tree planting, streambank restoration, phragmites culls, etc.) often in coordination with Conservation Authorities; communicating directly with provincial and federal governments on issues important to us; and many more things besides. The WAG pays particular attention to the preservation and protection of the provincially significant Silver Creek Wetland from considerable and ongoing development pressures. 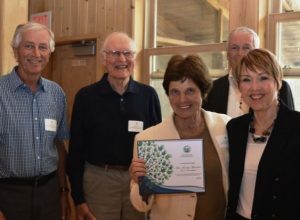 The BMWTF “took up the torch” from the Senior League (now the Nature League) in the campaign to save this last remaining coastal wetland on southern Georgian Bay. We are always on the lookout for new members. There are many organizations competing for your attention—it’s tough to support them all. We certainly hope that you will choose the Watershed Trust. Simply become a member, or take an active role with us.